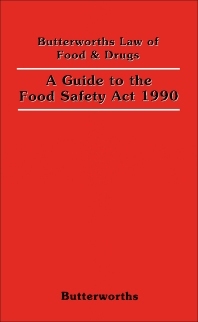 Butterworths Law of Food and Drugs: A Guide to the Food Safety Act 1990 contains the text of Food Safety Act 1990. The act aims to regulate modern food manufacture and distribution practice. The coverage of the text includes the preliminary, main provisions, administration and enforcement, and miscellaneous and supplemental discussions on the law. The text provides annotations that cover matters that are “new” or important for the understanding of the new Act. The book will be of great use to individuals who wish to fully comprehend the Food Safety Act 1990.